Oxygen: The micro-organisms that decompose the compost need oxygen to respire. To ensure the supply of oxygen, the compost must remain airy. To ensure the lightness of the compost, use coarser substance, so called dry bedding, among the compact waste and toss the compost as required. Your compost may also run out of oxygen if it gets too wet. The denser the compost is, the more easily it soaks and becomes an anaerobic heap of waste. Moisture: There is a good rule of thumb for testing the wetness of the compost - if you clench some compost in your hand, a few drops of water should be extracted from it. If water runs freely between your fingers, the compost is too wet. Nutrients and Energy: The micro-organisms in the compost use energy from the organic waste for maintenance of their vital functions. The micro-organisms need carbon compounds to generate energy and nitrogen to build up their cells. They also use other nutrients, but the ratio between carbon and nitrogen is vital for successful composting. Heat: In a large compost heap, the outermost layer of the heap acts as insulation and the inner part composts. To ensure that sufficient heat is generated, an non-insulated compost must be at least one cubic metre in size. Smaller composts require an insulating jacket on the outside. According to the rule of thumb, the smaller the compost, the thicker the insulation should be. 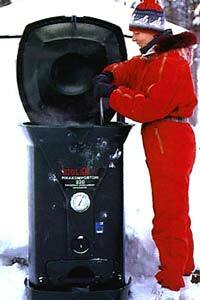 Designed for the cold winters of Finland, the Biolan 220 is a true year-round composter. 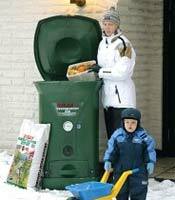 Biolan Composters are efficient, thermally insulated composters for year-round composting of domestic organic waste. Patented ventilation system supplies air directly to the middle of the compost mass, enhancing composting and diminishing the need to toss the compost. The adjustable air vent and the compost thermometer facilitate monitoring and attending to the compost, especially in winter. Use the bottom door of the Composter to remove mature compost and leave fresher mass to compost further. Please contact us for quotes on shipping rates. Biolan composters are shipped on a pallet by trucking company. Now in our 14th year, we are proud to have sold and supported over 38,000 mowers. People Powered Machines is more than an eco e-tailer, we are a long standing company with real people that support our products. We are totally committed to reducing gas mowing, noise emmissions, and returning pleasure to backyards everywhere! Let us know if we can help you with your decision in any way.